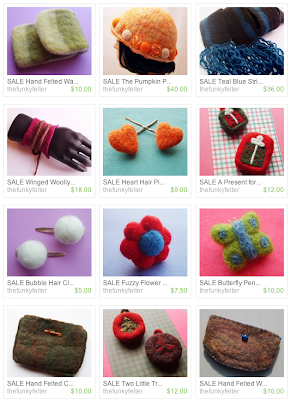 The Funky Felter: Black Friday through Cyber Monday Sales and Specials for my handmade felted goodies and my local Kansas City Etsy Street Team too! Black Friday through Cyber Monday Sales and Specials for my handmade felted goodies and my local Kansas City Etsy Street Team too! In honor of Black Friday and Cyber Monday, I have loaded my SUPER SALES section with fabulously discounted prices. My sale items are now 20% - 40% off! They also ship free to the US, UK, Canada, and Australia. Many of my regularly priced items ship free to those countries as well with low shipping rates to everywhere else. In addition to the great deals in my SUPER SALES section, for my blog readers only, I'm offering 30% off all non-sale items. This includes all regularly priced items that are not marked SALE in the title. All you have to do is type the promotional code "FFCYBERBLOG-30" in the message to seller at checkout. You must include the promo code in order to receive the discount. Please go ahead and pay via PayPal during checkout, and I'll refund 30% on all non-sale item prices via PayPal after purchase. (Or, if you prefer, I can send you an updated PayPal invoice, but please let me know that in the message to seller at checkout.) This promotional discount offer is only good from Black Friday, November 28th, through midnight on Cyber Monday, December 1st, so don't miss out! And, if that wasn't enough great deals for the weekend, my local Kansas City Etsy Street Team is having a holiday sale blowout with several shops participating. Click here to see listings of all the great deals from KCEtsy or search Etsy for "kcetsysale" to find them. Also, many shops are having shipping specials and including freebies with purchases. Please read shop announcements for individual shop deals and visit the team's blog for more information. I have to comment on the layout of your blog. It's real chic especially with the photos of the felt at the top.